Super Bowl is one game that brings everyone in America together. Whether your're a football fan or not you've most likely watched a Super Bowl in the past, if not making an annual tradition with friends and family. While I'm more of a hockey or baseball girl I do enjoy watching football games with friends and family, especially the Super Bowl! In fact, one of the most memorable football watching experiences in my life was Super Bowl XLI (2007) - Colts v. Bears. I have no allegiance to either of those teams (though I do love Peyton Manning so I was rooting for Indianapolis!) I will always remember watching the game in Riviera Maya, Mexico with my then new husband on our Honeymoon! It was such a great experience to watch with complete strangers and see how the resort outdoor auditorium was segregated in to Bears fans and Colts fans. One of the things about Super Bowl that brings everyone together, regardless if you're rooting for opposing teams, is the food! There is something about game day food that makes everyone happy! Chili, Wings, Pizza, Potato Skins, Nachos, Salsa, etc. The list goes on and on, but I always ensure that I bring a dessert every year for Super Bowl, regardless of where I'm going. This is one night of the year that there is never too much food! After reviewing my list of cupcakes I need to try I decided on Cookies & Cream cupcakes. I love Oreos, and my friends love Oreo Truffles so I thought this way I could do both! I sampled one a little bit ago, and let me tell you that these cupcakes will definitely please my friends. Not to mention, these may be my new favorite cupcakes, tied only to the Snickerdoodle cupcakes. Not only are these everything you expect in Cookies & Cream, how do you not love an Oreo Truffle as garnish?! 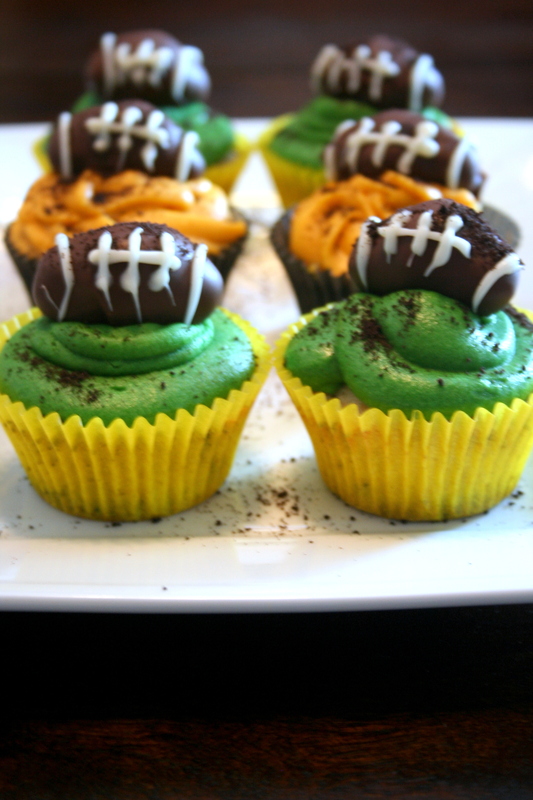 I decorated the cupcakes to support both teams, and though I don't have an allegiance to either team this year - ever since high school I've been a Green Bay fan thanks to pre-scandal Brett Favre. So, this year I'm letting it known that I am team Green Bay. Go Pack :)! Frost the cooled cupcakes as desired. Sprinkle with Oreo crumbs and garnish with Oreo halves or truffles. These look adorable! So perfect for Superbowl!